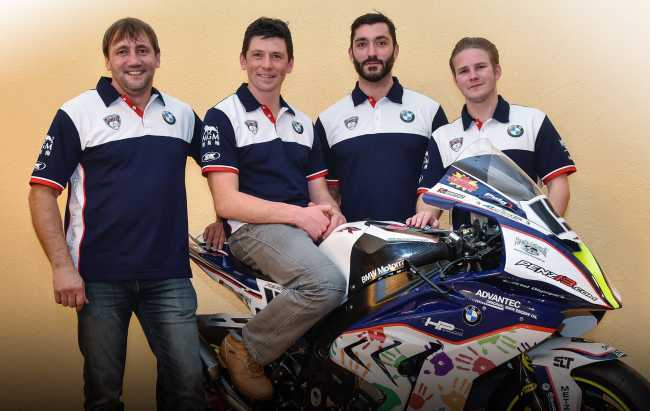 Penz13.com BMW Racing Team signs Dan Kneen and retains Danny Webb and Alessandro Polita for 2017 campaign. Penz13.com BMW Motorrad Racing has confirmed Dan Kneen will join the team for the 2017 Isle of Man TT Races fuelled by Monster Energy and other road races. The 29-year-old Manx rider joins Danny Webb and Italian Alessandro ‘Alex’ Polita riding BMW S100RRs for the German team. Since his TT debut in 2009, Kneen has been a regular top ten finisher with a highest placed finish of 5th, which he achieved in the 2010 Monster Energy Supersport Race. Kneen first tacked the Mountain Course in the 2008 Manx Grand Prix, becoming the first rider to achieve three race wins in a week at the MGP. Kneen also has numerous wins in Irish road races and won the 2014 Irish Superbike Road Racing Championship. Danny Webb remains with the team and will be looking to build on last year’s success. Webb established his name in the 125cc and Moto3 championships with his last Grand Prix appearance to date at last year’s Sachsenring Grand Prix riding for Mahindra. He raced regularly in Grand Prix between 2007 and 2012 before embarking on a road-racing career. 2017 will be the 25 year old’s fourth campaign at the TT, having made his debut in 2014. His best result to date is the 10th placed finish he achieved in the 2015 Bennetts Lightweight TT and he’ll be keen to improve on his 26th place in last year’s PokerStars Senior TT with the Penz13 outfit. It's the second TT for Italy's Alessandro Polita, after making his debut with Team Penz13.com in 2016. Before road racing, he won the 2007 FIM Superstock 1000 Championship and enjoyed 22 World SBK starts. In 4 years of competing in the FIM Superstock series, 32-year-old Polita earned a total of 16 podiums out of 38 races including five wins.